Willa is a Seattle native who grew up in a union household and has continued that tradition in her own family. Her husband is a union carpenter. Prior to joining the WSLC, she worked as a hairstylist in Seattle and found her calling as a preschool teacher. She loved teaching and caring for children, but wanted to be able to provide for her family more. 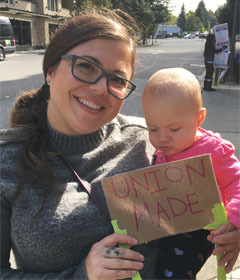 Being a union member and supporting other unions have given her the financial stability that she and her family need to thrive. In her free time, Willa enjoys being with her family and traveling as much as possible.